Iberis sempervirens is an early season favorite. 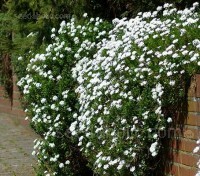 This low bushy plant produces mounds of blinding white flowers in spring to early summer. 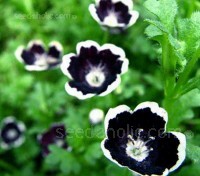 An all round tough plant suitable for problem areas, use for containers, for pathways and crevices of ornamental walls. 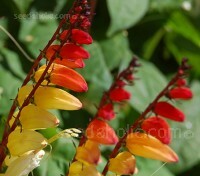 Ipomoea lobata is a fast growing climber with an exotic appearance. The tightly formed buds are flame-crimson in colour, but as they enlarge they transition to infused shades or orange and cream which brings the flowers to life. 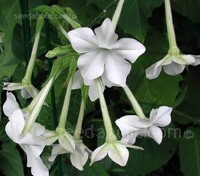 It will look spectacular for months and is one of the best climbers you can grow. Ipomoea pennata is undoubtedly one of the most beautiful of all annual vines. 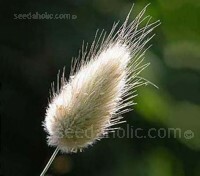 The feathery foliage with thin, thread-like leaves give the plant a light, airy texture. 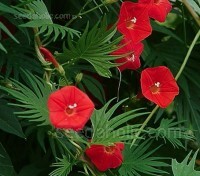 In summer the plants burst into flower and are covered with hundreds of scarlet red, star shaped flowers. 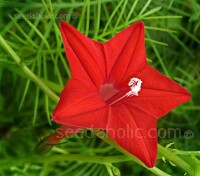 Ipomoea sloteri is an annual twining vine. A hybrid, with the best characteristics of each parent, this very graceful, airy vine is festooned with pentagon shaped blooms throughout the summer. The leaves look like they've been cut with a scalpel and create a beautifully backdrop to the deep red blooms. Knautia arvensis is an attractive native perennial herb of well drained grassland. It can be found throughout Europe in meadows, rough pasture, hedgerows and verges. Though it is by nature a perennial, it will flower and produce seed the first year if grown as an annual, either autumn or spring sown. Lagurus ovatus is probably the most appealing of all the ornamental grasses. The name ‘Hare’s Tail’ perfectly accurately describes the creamy-white flower heads, which are hare's tail-shaped, fur-like and soft to the touch! 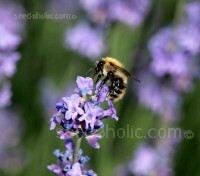 The deepest purple of all and one of the most popular lavenders is 'Hidcote Blue'. 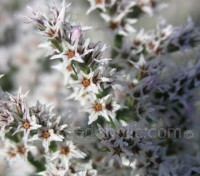 A compact variety, suitable for growing in borders or as dwarf hedging, with dense silver-grey foliage covered in fragrant, dark purple-blue flower spikes in mid-summer. Lavendula angustifolia is an excellent plant for low informal hedging and as a specimen evergreen for borders and formal gardens. 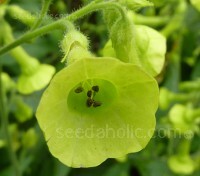 Flowering generally begins from mid to late June to early July. 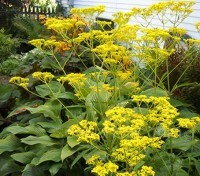 The flowers have a rich sweet scent and are highly attractive to bees and other beneficial insects. 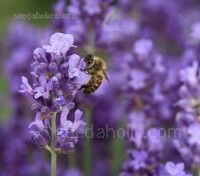 Lavandula angustifolia, also called Lavender vera is the best Lavender for medicinal and aromatherapy purposes. It is a staple plant for the herb garden, the fragrant flowers have been used in perfumes, poultices and potpourris for centuries. Organic Seed. 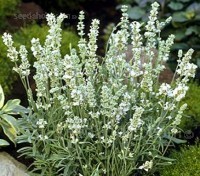 'Ellagance' are first year flowering lavenders, 'Ellagance Ice’ is the white flowered variety. The deliciously perfumed, pure white blooms make an enchanting informal aromatic hedge in the garden. 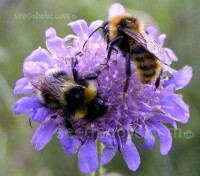 The flowers are produced from July onwards and are highly attractive to bees. 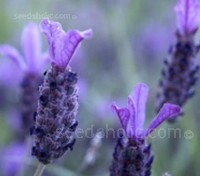 'Ellagance' are first year flowering lavenders, boasting large flowers and a compact bushy form. ‘Ellagance Pink’ is the newest addition to the series. The deliciously perfumed, delicate pink blooms are produced from July onwards and are highly attractive to bees. 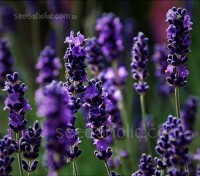 “Ellagance” are first year flowering lavenders, boasting large flowers and a compact bushy form. 'Ellagance Purple’ with compact foliage, its dwarf habit makes it suitable for borders or patio containers. The deliciously perfumed, rich purple blooms make an enchanting informal aromatic hedge in the garden. 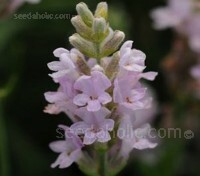 'Ellagance' are first year flowering lavenders, boasting large flowers and a compact bushy form. 'Ellagance Purple’ with compact foliage, its dwarf habit makes it suitable for borders or patio containers. The deliciously perfumed, rich purple blooms make an enchanting informal aromatic hedge in the garden. Lavender stoechas is an old variety, cultivated for more than 400 years, it is a favourite both for its intense fragrance and for the short dense flower spikes. 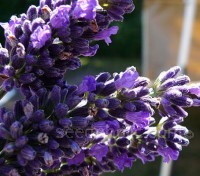 French Lavender blooms from spring to frost and has a good clean scent. Coveted by crafters and arrangers, every devotee of dried-flower arrangements is no doubt familiar with Statice. This perennial variety is a stunning spectacle when in bloom, producing clusters of silvery white frilly flowers that last all summer. Delicate and exquisite, they look like they are made from paper. 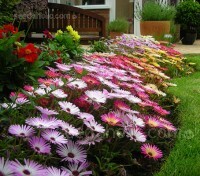 This is the familiar Livingstone Daisy or, as it seems to be generally known, just "Mesembryanthemum". A cultivated strain of this splendid annual plant with a spreading habit, the plants are covered with flowers in a wide range of brilliant shades of gold, salmon, pink, purple and carmine red. 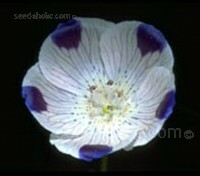 Pretty flowers with five white petals, each with a deep blue spot at the tip. Very easy to grow they are an ideal addition to rockeries, hanging baskets or other containers where their hardiness and dry-tolerance ensures a good display. Baby Blue Eyes are delicate little plants with bright and vivid light blue flowers. Very easy to grow they are an ideal addition to rockeries, hanging baskets or other containers where their hardiness and dry-tolerance ensures a good display. 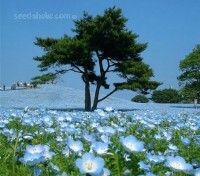 Nemophila menziesii var. atomaria 'Snowstorm' is quite a long name for this tiny little flower. 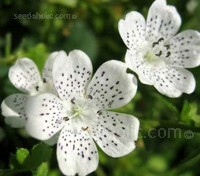 A real treasure that is rarely available as seed, it features blooms with a pure white background, heavily dotted with tiny black speckles, which explains why it is also known as 'Freckles'. 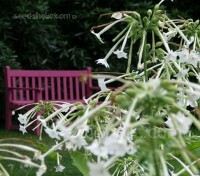 Nicotiana affinis, also known as N. alata, is a classic tobacco plant with a delicious evening scent. It has been justly popular for over a century and a firm favourite with generations of gardeners: it is far lovelier than the modern improved forms of Nicotiana alata. Nicotiana langsdorffii is Brazilian member of the tobacco family and one of those plants that deserves its present high reputation. The chartreuse green panicles of drooping bells add an important ingredient to the garden's palette of colours, a colour that fits in to a great variety of planting schemes. With elegant, pure white, large clusters of glistening white blooms that are intensely fragrant, Nicotiana sylvestris 'Only the Lonely' makes an aristocratic statement. When in full flower, each head resembles a graceful explosion. Patrinia scabiosifolia has continued to languish in relative obscurity until very recently. Resembling a cross between achillea and the immensely popular Verbena bonariensis, it has all the requisite qualities, airy see-through grace, a strong branching structure, plus sheets of sparkling chrome-yellow flowers.